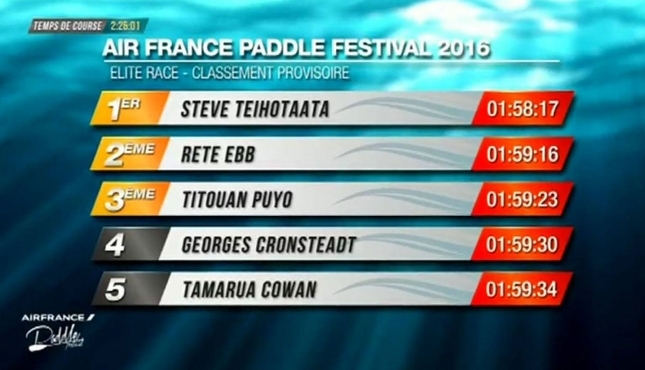 Steeve Teihotaata has taken out the 2016 Air France Paddle Festival in Tahiti, defeating hot favourite Titouan Puyo as well as fellow Tahitian titans Rete Ebb, Georges Cronsteadt and Tamarua Cowan to announce himself as a genuine contender on the international stage. Following two hours of downwind and flat water paddling around Tahiti’s north-west coast, and after a close battle first with Titou and then Rete, Steeve produced an amazing performance over the final kilometre, pulling away to win in a time of 1:58:17, one minute clear of a tight race for second. Steeve, who paddles for Team Mistral, set the pace early and never looked back, trading the lead with Titou (NSP/Quickblade) in the light downwind bumps. Titou looked comfortable and strong in the mild downwind conditions, and was the only guy that could hold pace with Steeve early on. For much of the race it was a great battle between the world beater Titouan and the ultra dark horse challenger in Steeve. 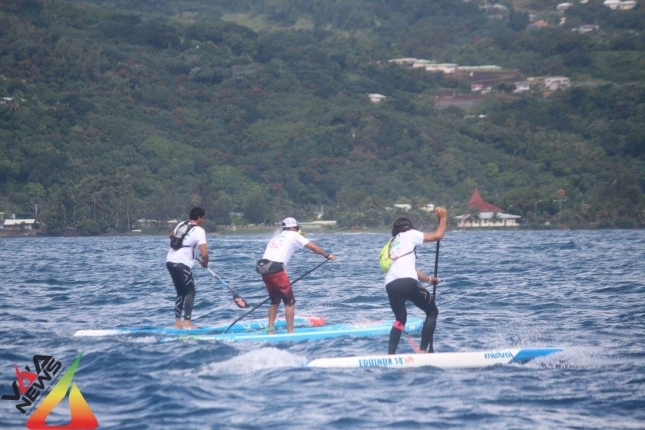 Indeed, these two guys were neck-and-neck for so long that it looked certain to be a two-man battle all the way to the finish, but as the course left the open ocean and entered the protected, flat water lagoon inside Tahiti’s outer reef, things began to change. Although Titou was never far off the pace, and was still in contention almost all the way to the finish, the world number three appeared to tire slightly around the 1 hour 30 minute mark, while Steeve seemed to power on at full strength. At the same time, Rete began to make his move, reeling in the leaders and making it a three-way battle. Rete was helped by a slight mistake from Steeve and Titou, who veered too close to shore and were briefly stuck on rocks in the shallows, losing valuable seconds as they corrected their course. The whole time this was happening, Georges (SIC) and Tamarua (Starboard) were never far off the pace and always remained within striking distance. After Steeve, Titou and Rete battled side by side for the next five minutes, Rete made a move and pulled clear, briefly holding the lead before being reeled in by Steeve. The two local outrigger champions sat side-by-side as the race entered the closing stages, while Titou was never more than 10 board lengths behind which made the race seem destined for a tight finish. But then Steeve did something incredible. Despite having already paddled at an incredibly high pace for close to two hours, Steeve seemed to find another gear when he needed it most. 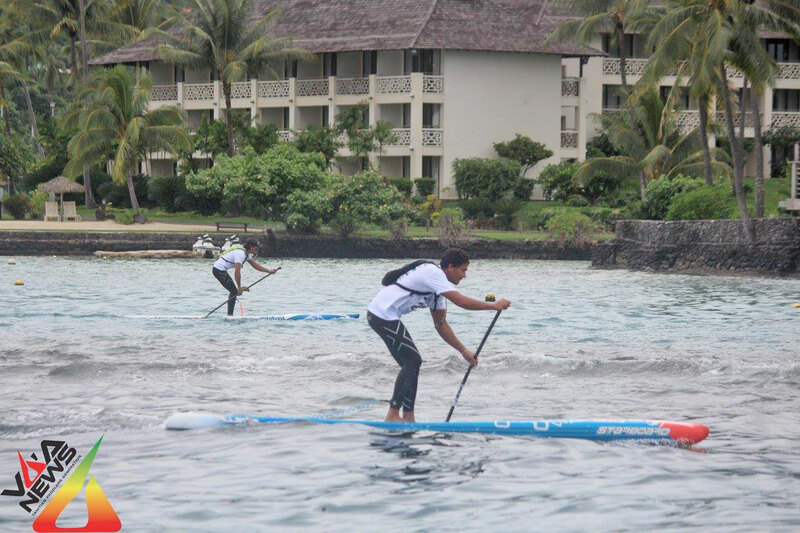 He began paddling with an awesomely fast stroke rate to produce a burst of speed that Rete and Titou simply couldn’t match, and which left them, along with Georges and Tamarua, in a race for for the minor placings. Steeve was crouched right over during the final 500 metre “sprint” to the finish, seemingly channeling his outrigger skills to display a rather unorthodox but very effective technique that allowed him to maintain his margin all the way to the line. He reached the shoreline and raised his arms in triumph, with the next four guys left in his wake to battle for the minor placings. Rete held off Titou for the runner-up spot, while Georges and Tamarua charged home over the final kilometre to almost completely close the gap. Steeve’s impressive win propels him inside the Top 100 leaderboard on the SUP Racer World Rankings for the first time. The Mistral team rider is now ranked 52nd in the world, and considering he’s only holding two results out of a possible best five, Steeve will certainly move a lot higher as the season progresses. Rete also makes a big move, jumping +51 spots to a new ranking of 42nd in the world. Rete is still holding two “donuts” in his best five results, so again, look for the Tahitian boys to make a move up the leaderboard as the year progresses. Tamarua Cowan also earns a spot just inside the Top 100 despite this event being his only international result from the past 12 months. Check out the updated SUP Racer World Rankings for the latest leaderboard changes. A few of my friends in Tahiti had commented before the race that “Everybody really wants to beat Titou this weekend!” — there was plenty of excitement on the island about the presence of the “Conqueror of the Carolina Cup.” The French superstar clearly had a big target on his back even before the race began, and Steeve clearly had the best aim. It was an extraordinary performance from Steeve (and from Rete as well, I might add), especially when you consider how strong Titou was in defeating Travis Grant, Danny Ching, Connor Baxter and most of the world’s best just last month. It’s actually quite amazing to think that just a few weeks ago Titouan was pulling away from Danny, Travis and Connor over the closing stages of the Carolina Cup in what was a world-beating performance, and now today Steeve and Rete did the exact same thing to him. Just goes to show the incredible depth of talent and fresh blood that’s entering our sport these days. Both Steeve and Rete (and Georges, and pretty much every single top stand up paddler in Tahiti) come from an outrigger background (or “va’a” as it’s known in Tahiti), and would know these waters like the back of their hands, which no doubt helped their race strategy (Steeve and Rete are actually team mates in the dominant EDT six-man team, so it’s rather appropriate that they finished 1-2 today). This isn’t Steeve’s first big win though — he famously dominated the 2015 SUP 11 City Tour in the Netherlands back in September. There will be no rest for the victor though, with Steeve set to hop on a plane to France in a couple of days, where he’ll compete at next weekend’s big SUP Race Cup in St. Maxime followed by the Lost Mills race in Germany (aka the “Headline” events of the EuroTour). Last month, we mentioned how both Steeve and Rete are genuine dark horse contenders for season 2016, and today they showed why. Not only did they triumph against the world-beating Titouan, they also dethroned Georges, the defending Air France champion and long-standing king of Tahitian stand up paddling. Tahiti has long been known as the absolute powerhouse nation in the outrigger canoe world, a sport that’s very similar to stand up paddling and which has already produced many famous cross-over athletes (Danny, Travis and even Titou all have an outrigger background). 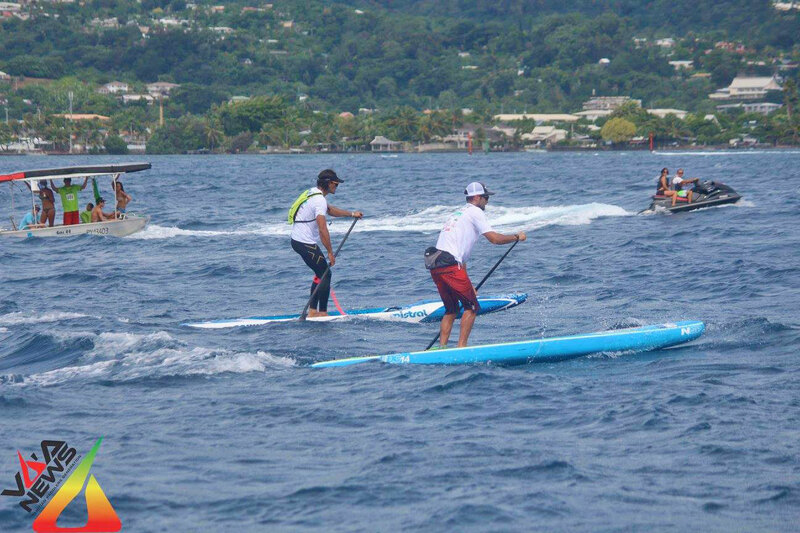 Now Tahiti’s outrigger heroes are crossing over into SUP racing in increasingly large numbers, and judging by today’s results that should be an ominous warning for the rest of the international elite field, particularly when it comes to these types of long distance races that the Tahitians specialise in. But while Tahiti dominated today’s men’s race, France regained a little ground with Olivia Piana taking out the women’s race ahead of the local contenders. Olivia crossed the line in just over 1 hour 15 minutes, and while only a handful of women took part in the 24km elite race (there were also 3km and 9km races that attracted the bulk of the event participation), Olivia showed strong form to finish ahead of more than half the guys. Olivia was one of Europe’s top female paddlers a couple of years ago but then took an entire season off in 2014/2015. She returned to racing late last year, taking out the big Paris Crossing in December to prove that she hadn’t lost any of her strength. Look for the Starboard team rider to feature again at the European races this summer. The 2016 Air France Paddle Festival was streamed live and, despite a couple of bandwidth issues that saw the feed drop out a few times, it was a very high quality broadcast that gave us an excellent window into Tahiti’s biggest SUP race. Even though the commentary was in French, we could easily follow what was happening in the race. Not only was it streamed live for everyone online, it was also broadcast live on Tahitian TV. 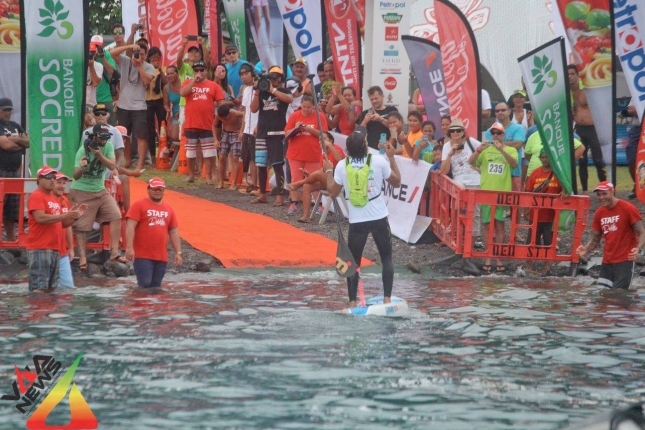 Definitely a good sign for the future of this event, which is clearly Tahiti’s premiere international SUP race. I was actually sitting over here in Spain, fresh from the Port Adriano SUP Race, watching the action and chatting about the race on Facebook with some of the guys in Australia, Tahiti, Japan and Hawaii as the play-by-plays unfolded. Good stuff. Anyway hare the full results, while the excellent Va’a News Tahiti has plenty of photos on Facebook. Also take a look at the updated SUP Racer World Rankings, with Steeve, Rete and Tamarua making big moves up the Top 100 leaderboard. The Air France Paddle Festival was a 2-star “regional major” event, which scored a guaranteed 20% on our Race Index (meaning the winners earned 20.00 world ranking points).